Andrej Lebedev was born in St Petersburg, Russia and has been living in the Stuttgart area for over 20 years. In the course of several tours in Europe and Russia, Lebedev has made a name for himself as concert guitarist, composer and arranger. He is also an excellent guitar teacher. Many of his pupils have won prizes in national and international competitions. Lebedev`s projects are evidence of his diversity: He is equally at home in classical chamber music as well as romantic virtuoso pieces and present day compositions. Lebedev has developed a wide knowledge in performing popular music styles. 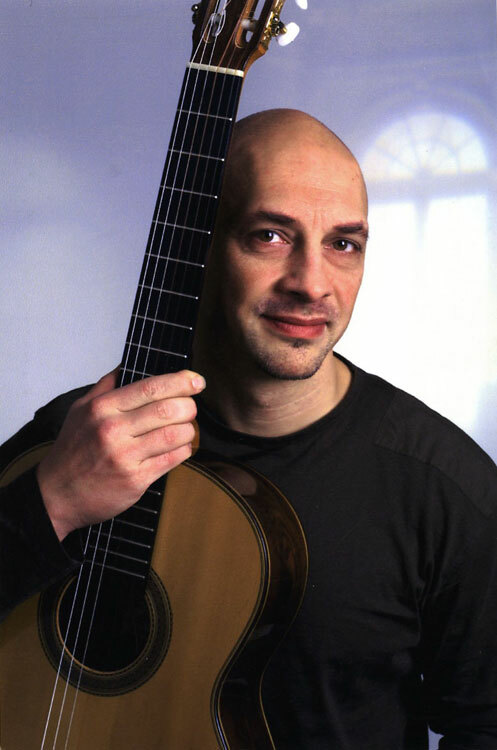 At the moment the World Music Projects combine finely tuned own arrangements of classical guitar technique with pulsing latin american, african and asian rhythms. So far Lebedev has brought out 5 CDs and features as guest musician on other CDs. Currently he is part of the following musical ensembles: AireLatino with Martin Romero (percussion and vocals) and Wieland Braunschweiger (bass and background vocals), Trio Cosmoacustico with jazz singer Fauzia M. Beg and Andreas Renz (double bass), Duo Paganissimo with Jewgeni Schuk (violin). He makes regular appearances in Theater unterm Regenbogen where he is active as composer and musician.